Director Colin Trevorrow has confirmed leaked story details about the fourth Jurassic Park film's plot, settings, and characters. Massive spoilers ahead for Jurassic World. After plot details were leaked last week, director Colin Trevorrow spoke with SlashFilm to confirm some of leaked details and address fan concerns. 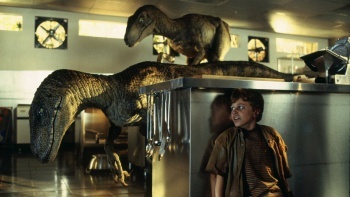 Trevorrow confirmed that Jurassic World, formerly known as Jurassic Park 4, picks up twenty-two years after the events of Jurassic Park. The story takes place on a fully functioning dinosaur park on Isla Nublar, the same island where the events of Jurassic Park occur. The park is a popular and successful tourist attraction, featuring a luxury resort, a theme park, a safari, a biological preserve, and, of course, dinosaurs. A new dinosaur species will appear in the film, created by geneticists at the park. "This creation exists to fulfill a corporate mandate-they want something bigger, louder, with more teeth," says Trevorrow. "I know the idea of a modified dinosaur put a lot of fans on red alert, and I understand it. But we aren't doing anything here that Crichton didn't suggest in his novels. This animal is not a mutant freak." The film stars Chris Pratt and Bryce Dalla Howard. Pratt's character Owen is a former military man conducting behavioral research on velociraptors. The original leak suggested that these velociraptors were trained "good guy" dinosaurs, but Trevorrow dismissed that idea. "There's no such thing as good or bad dinosaurs. There are predators and prey," says Trevorrow. "Chris Pratt's character is doing behavioral research on the raptors. They aren't trained, they can't do tricks. He's just trying to figure out the limits of the relationship between these highly intelligent creatures and human beings. If people don't think there's potential in those ideas, maybe they won't like this movie. But I ask them to give it a chance." Universal announced earlier this month that Jurassic World would be delayed from its original summer 2014 release date. The film is instead scheduled to release in summer 2015.